Hello! Thank you for stopping by my S.M.A.R.T. Initiative – Social Media Awareness and Responsibility Training! Just a little corner of the world wide web where you’ll find various tools, links and app reviews concerning the online safety of our children. Now is the time to get Primed rather than remain Paranoid; where Concern is Appraised! Did you search for a specific app and you cannot find it here on S.M.A.R.T? No problem; send me a request! Scroll to the very top of this page & click on, “Request app Review!” Within 24 hours; I will research the app, have it ranked, and a breakdown will be posted right back here from your submission! I take great pride in assisting you with the education of Social Media with regards to your children. Parents, Social Media is not a fad; it is a change in the way we communicate. Learn this social communication for the safety of our children. Interested in a free live presentation where I discuss the 4-step process of keeping your children safe on social media? Just scroll back up to the top of the page and click on “Upcoming Presentations,” where you will find a calendar of previously scheduled events! Hope to see ya soon! Do you know… what they’re downloading… I do! 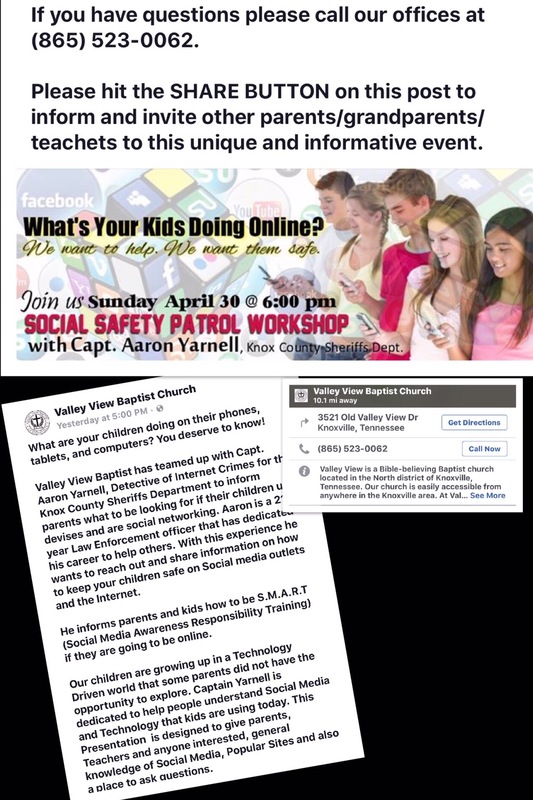 Come see me April 30 at 6pm for a presentation on how to keep your kids safe online at Valley View Baptist. Located at 3521 Old Valley View drive, Knoxville Tn. As always, free of charge.